1. Q. How do I maintain Low Water Cut-Offs? Find detailed maintenance instructions for McDonnell & Miller low water cut-offs in the installation and operating instruction manual (IOM) that ships with the product. You can also get the IOMs online at www.mcdonnellmiller.com. Here’s a brief summary of required maintenance. Please refer to the appropriate IOM for detailed instructions. The National Board of Boiler and Pressure Vessel Inspectors (ASME) recommends daily blow-down and testing of all low water cut-offs on commercial steam boilers. Many local codes require this. 2. Q. I installed a new electronic water feeder – why is my boiler flooding? Faulty installation can cause flooding. Remember that the closing level of make-up feeders on heating boilers should be set 2″ to 2 1/2″ below the manufacturer’s recommended boiler water line. This lets the system return balance varying steaming rates without adding make-up. • Make sure the boiler water level is above the feeder’s closing level. • Close the outlet valve in the feed pipe – running from the feeder to the boiler. • Uncouple (break) the union between feeder and boiler. – Lower the boiler water level to observe water flow through the feeder. come out of the union, the water feeder is leaking and needs to be repaired or replaced. – Open the outlet valve to verify there is a steady flow of water coming back from the boiler. If not, check the feed line for lime or scale, which can hold the feeder open due to back pressure. • Check for leakage past the bypass valve by opening the union below the bypass valve. 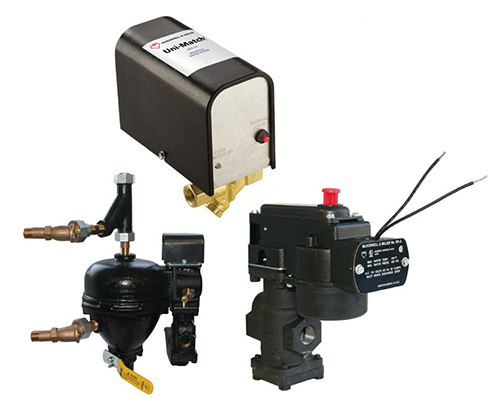 – If there is a leak, repair or replace the bypass valve. 3. Q. Why won’t the valve shut off drip-tight? Do the broken union test to be sure the valve really is leaking. 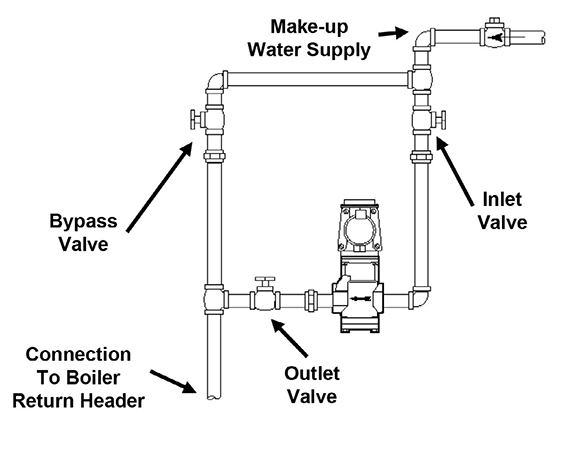 Often the valve is not leaking, and the cause of the flooded boiler is in the system. If the valve is leaking, your best option is to replace it—especially if it’s an old-style pilot action valve or metal-to-metal valve. Bring it up to date with a cartridge valve. Initially, you’ll have to replace the whole valve (models SA47-101-102 & SA51-101-102…pre-August 1995.) After that, you’ll need to replace only the cartridge if the valve fails to shut off drip-tight.